By placing Saint-Malo at 2 hours 15 minutes from Paris by 2015, the TGV (HST) completes the sideboard of the territory. Already benefiting from a good road network and from daily sea and air links with Great Britain, Saint-Malo, Brittany North's door is ready today to fire the best profit of this perfect connection. The arrival of the BGV " Brittany High speed " in 2015 will allow to join Paris in only 2 hours 15 minutes from Saint-Malo. 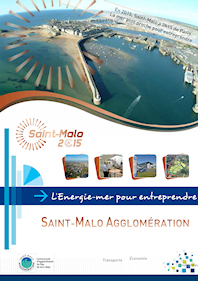 The BGV which will strengthen the traffic and the accessibility of the whole region, will make of Saint-Malo one of the littoral cities the most close to Paris with Saint-Brieuc, Dunkerque and Le Havre.